Start by chopping the onion. Add some oil to the bottom of a large pot (I like to use half vegetable and half olive oil) then add the onions and let them cook over a medium heat. It’s best not to be too frugal with the oil, if you do, the chances are the lentils will stick to the bottom of the pot later on. 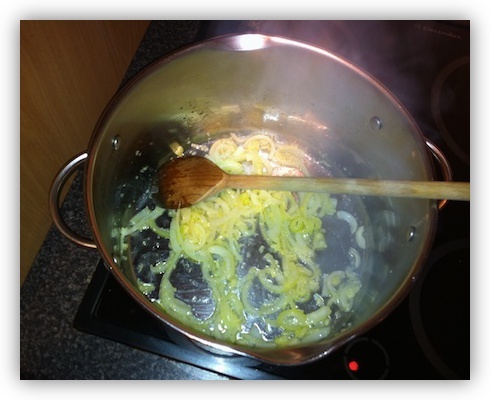 While the onions are sizzling away you can crush the garlic, measure out the Lentils, and prepare the stock. 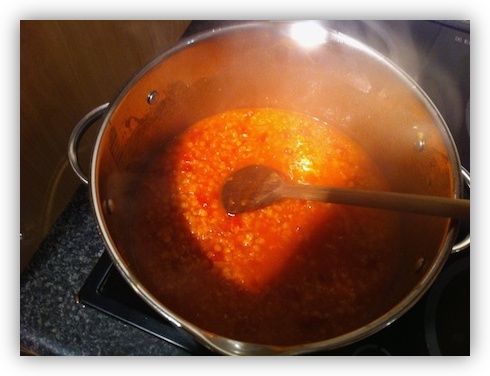 When the onions are soft, add the stock, garlic, lentils and tinned tomatoes, and stir it all together. Increase the heat to bring the mixture to the boil, remembering to stir from time-to-time to stop things sticking to the bottom of the pot. When the mixture comes to the boil, turn down the heat and let it simmer for about 20 minutes. You should notice that the lentils which had initially sunk to the bottom start to really swell up as they absorb more and more of the moisture, and start to rise to the top. You’ll have to stir occasionally while the mixture simmers to stop the lentils sticking to the pot. The more oil you used initially, the less important this will be. After the 20 minutes are up, take the soup off the heat and blend. Then add the chopped fresh Parsley or the dried parsley. If you’re using fresh you need to add 1-2 table spoons, but if you’re using dried you should add a little more. Finally season with salt and black pepper to taste. 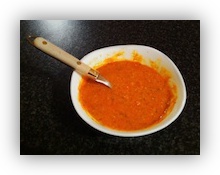 The soup has a lot of flavour naturally, so be careful with the seasoning, it’s easy to over-do it. 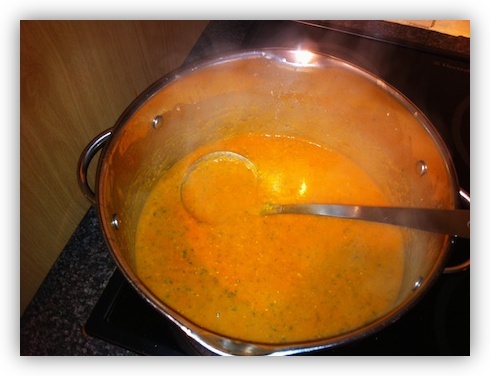 And that’s all there is to this lovely thick wholesome soup. Definitely great on cold winter nights! 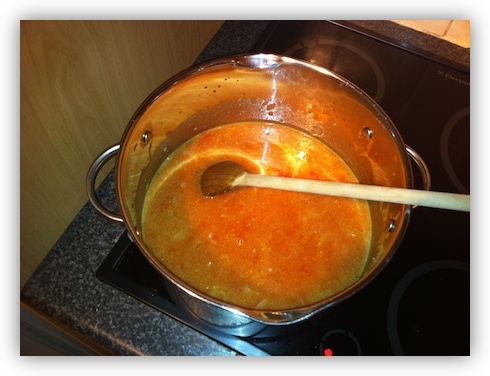 The soup was a great success! I added a squeeze of lemon, a pinch of sugar, chopped green onions & a dried chili pepper. Filled the spot nicely with plenty left over for lunch the next day. in the last step when you say “blend”, do you mean throw it in a blender? Gwensonic – fantastic! 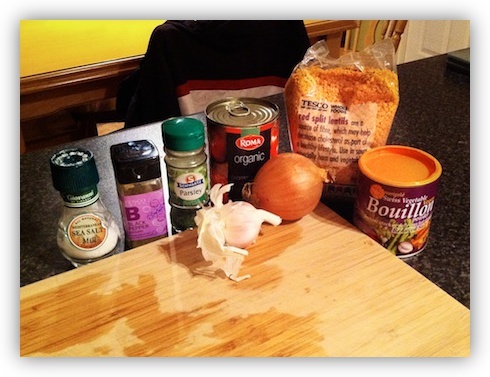 so glad you enjoyed the soup, and thanks for the suggestions for some added flavours to spice it up a little more – much appreciated! so…what’s a hand blender? do you mean a whisk? I don’t have a food processor. In the US a blender is a glass container with a lid that has a screw on blade in the bottom, you set it on a stand that has buttons to change how fast the blade spins. Allison – you could definitely use what you call a blender – we call that a food processor. A hand blender (AKA immersion blender) is like an electric whisk, but instead of a whisk bit that spins around, it has a long shaft, at the bottom of which is a spinning metal blade. The blade has a cover over the top of it, and around the sides, but the bottom is open and the sides have holes to let the blended stuff out. You pop it into the pot, turn it on and then just move it about until everything’s mush. Dead handy! Just as an aside, I tried but wasn’t able to get to Dublin whilst you guys were all together. Next visit I hope Kinsale is in you’re agenda, it’s a great little town & I know you all will love it! Cheers for the invite Gwensonic – when I’m back on my feet I may well take you up on it. Some sea air this summer sounds like a good idea – and nerd-friendly sea air sounds even better! I would bet $100 that this is the first time the term “nerd friendly sea air” has ever need used.